Today’s Texplainer question was inspired by reader Tiffany Adair. Hey, Texplainer: How do employment benefits for Texas educators compare to those in other states? This question has been a point of contention between lawmakers and educators for many years. Texas teachers say they’re frustrated due to a lack of state funding for public education. But lawmakers say the uncertainty surrounding the budget makes it hard to allocate better benefits for educators. If you look at the raw numbers, Texas ranked 27th in the nation for teacher pay in 2016, according to the National Education Association. On average, Texas teachers earned $51,890 — roughly $6,500 below the national average. However, teachers have long argued that inadequate funding for public schools cuts into their salaries. During the 2008 fiscal year, the state covered roughly 48.5 percent of the cost of public education, according to the Legislative Budget Board. By the 2019 fiscal year, that figure will be closer to 38 percent. Over the same period, teacher salaries remained about the same (Texas teachers, on average, earned roughly $47,000 in 2008). But salaries aren’t the only component to consider when looking at how Texas teachers fare compared to their peers in other states, said Ed Allen with the American Federation of Teachers. “When looking at a nationwide comparison, most people factor in the salaries. But when teachers get older, what’s being paid into retirement and the health insurance becomes a really big deal,” Allen said. When it comes to health care benefits, advocates say Texas teachers are stuck in 2002. That’s when state lawmakers created the plan known as TRS-ActiveCare. 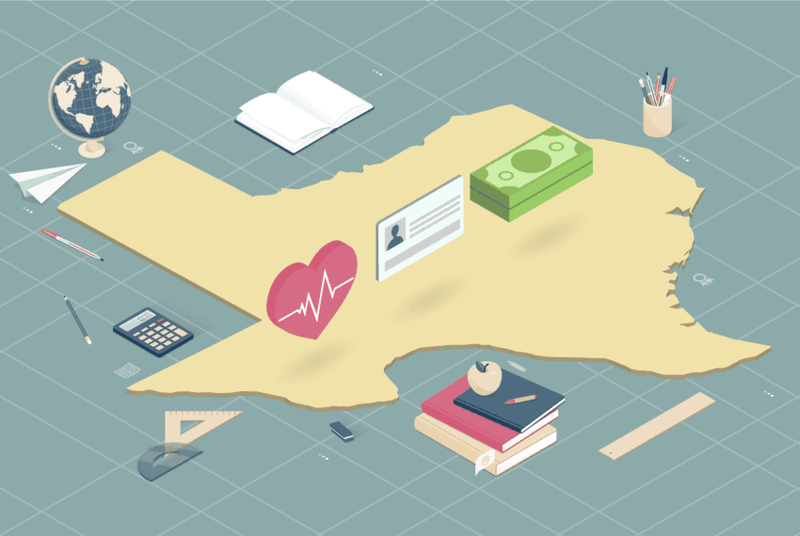 The teacher health insurance program, which is run by the Teacher Retirement System of Texas, requires the state to contribute $75 per employee toward monthly health care premiums. Nearly 430,000 public school teachers and retirees are covered under the plan, which is used by many of the state’s 1,200-plus school districts. Since the program went into effect, employees’ share of premiums have more than doubled, while the state’s contribution to teacher’s health care has remained the same. “When your salary is barely going up year after year, health care costs are going up considerably and you’re not getting any additional money put toward those healthcare cost by your employer — which is the state in this case — then effectively you’re taking a year over year cut to your salary,” said Monty Exter, a lobbyist at the Association of Texas Professional Educators. Under the TRS-ActiveCare program, districts are also required to put a minimum of $150 per employee per month toward health insurance premiums, with the option of contributing more. But Exter said that can be difficult for districts as education budgets are squeezed. When it comes to retirement funding, a majority of states pay into both a pension plan and Social Security. Texas is in the minority of states that only pays into a pension fund and does not pay into Social Security for the majority of its teachers — which means most Texas teachers won’t have access to Social Security benefits when they retire. Fewer than 50 of the state’s districts participate in Social Security on their own. Among states that only offer a pension plan for teachers, Texas is dead last when it comes to funding its pension programs — by a lot. For years, Texas only paid 6 percent — the constitutional minimum — into the Teacher Retirement System. It now pays 6.8 percent, according to the National Association of State Retirement Administrators. And the Texas Constitution says the state's contributions to pension funds can’t eclipse 10 percent without a constitutional amendment approved by voters. “The next closest non-Social Security state had a retirement contribution rate at least double ours,” said Ann Fickel, the associate executive director of the Texas Classroom Teachers Association. The median contribution for the other 14 other states that don’t pay into Social Security for their teachers is around 18 percent, she added. “As retirees’ costs rise, especially for medical care, there will be pressure on lawmakers to find a way to increase benefits for retired teachers,” Fickel said. The bottom line: When it comes to teacher pay, Texas ranked 27th in the nation — right around the middle. But Texas is dead last in teacher retirement funding and puts a little more than the minimum into the Teacher Retirement System. Disclosure: The Texas State Teachers, the Association Association of Texas Professional Educators and the Texas Classroom Teachers Association have been financial supporters of The Texas Tribune, a nonprofit, nonpartisan news organization that is funded in part by donations from members, foundations and corporate sponsors. Financial supporters play no role in the Tribune's journalism. Find a complete list of them here.